There are few Scandinavian studies on the effect of computer assisted orthopedic surgery (CAOS) in total knee arthroplasty (TKA), compared to conventional technique (CON), and there is little information on effects in pain and function scores. 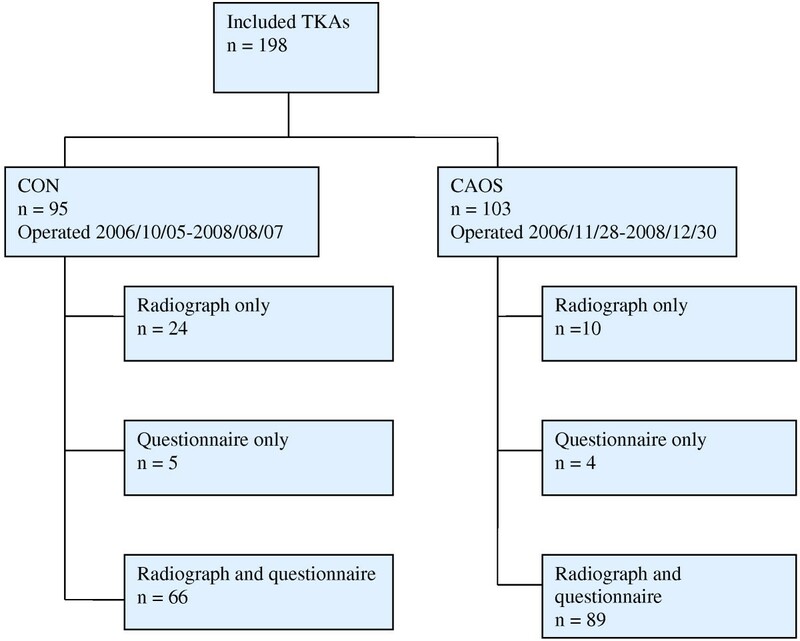 This retrospective study has evaluated the effects of CAOS on radiological parameters and pain, function and quality of life after primary TKA. 198 primary TKAs were operated by one surgeon in two district hospitals; 103 CAOS and 95 CON. The groups were evaluated based on 3 months post-operative radiographs and a questionnaire containing the knee osteoarthritis outcome score (KOOS), the EQ-5D index score and a visual analogue scale (VAS) two years after surgery. Multiple linear regression method was used to investigate possible impact from exposure (CON or CAOS). On hip-knee-ankle radiographs, 20% of measurements were > ±3° of neutral in the CAOS group and 25% in the CON group (p = 0.37). For the femoral component, the number was 5% for CAOS and 18% for CON (p < 0.01). 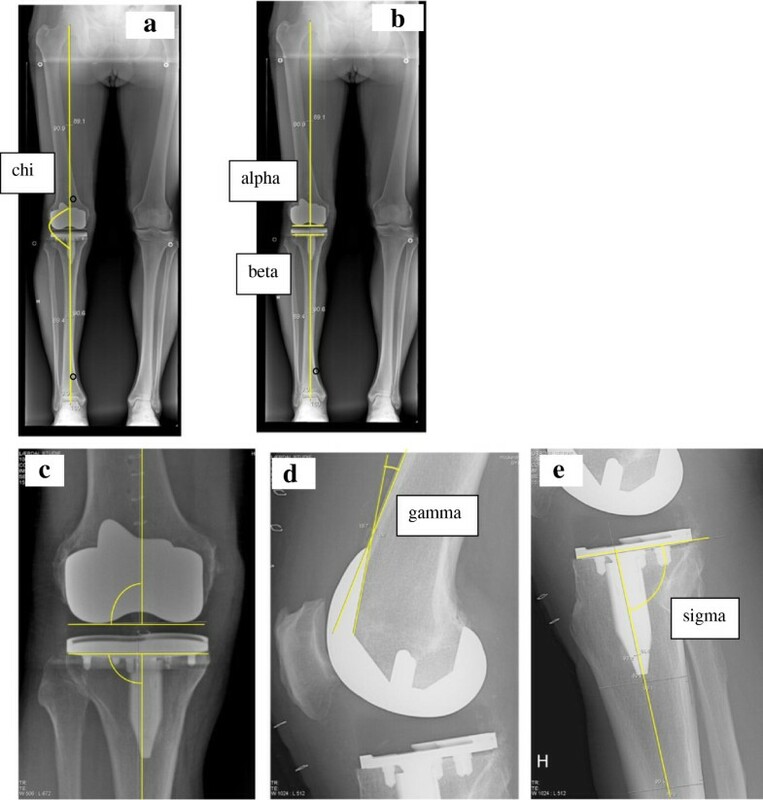 For the tibial component, the difference was not statistically significant (p = 0.58). In the sagittal plane, the surgeon tended to apply more femoral flexion and more posterior tibial slope with CAOS. We observed no statistically or clinically significant difference in KOOS score, VAS or ∆EQ-5D (all p values >0.05), but there was a trend towards better scores for CAOS. Operation time was 3 minutes longer for CON (p = 0.37). CAOS can improve radiological measurements in primary TKA, and makes it possible to adjust component placement to the patient’s anatomy. Over-all, the two methods are equal in pain, function and quality-of-life scores. Some studies have reported that CAOS improves the alignment of the components in TKA compared to conventional technique (CON) [1, 2]. More than ±3° malalignment is reported to have a poorer outcome in function and survival [3, 4]. A meta-analysis reported a reduction in rate of outliers (defined as more than 3° malalignment varus or valgus) when operated with CAOS of approximately 80% in limb mechanical axis (from 18.6% to 4.3%), and 87% (from 18.4% to 3.1%) and 80% (from 12.2% to 3.5%) for the femoral and tibial component, respectively . On the other hand, an analysis on data from the Norwegian Arthroplasty Register (NAR) has shown a higher relative risk of revision for computer assisted TKA in a short-term follow-up of two years, compared to conventionally operated TKA . Few papers have been published in Scandinavia, and there is also little information about the patients’ pain, function and quality of life using CAOS. The learning curve of CAOS has been an issue [7, 8], and few studies have been published with one single surgeon, proficient in both methods. In the frontal plane, the following angles were measured: the mechanical axis of the leg  (chi; Figure 2a) and the component alignment for the femoral (alpha; Figure 2b-c) and tibial (beta; Figure 2b-c) components [11, 12]. In the sagittal plane, following angles were measured: the sagittal femoral component angle (gamma; Figure 2d) and the sagittal tibial component angle (sigma; Figure 2e) . According to surgical plan the ideal value of chi, alpha and beta were 180, 90 and 90 degrees, respectively. In the CON group, the ideal gamma angle was 0-10°, whereas an ideal sigma angle was 86°. Sagittal alignments in the CAOS group were individually adjusted to the patient’s original anatomy, measured by the surgeon on preoperative radiographs. The questionnaire consisted of the validated Norwegian translation of the knee-specific knee injury and osteoarthritis outcome score (KOOS) (The translation can be found at http://www.koos.nu). 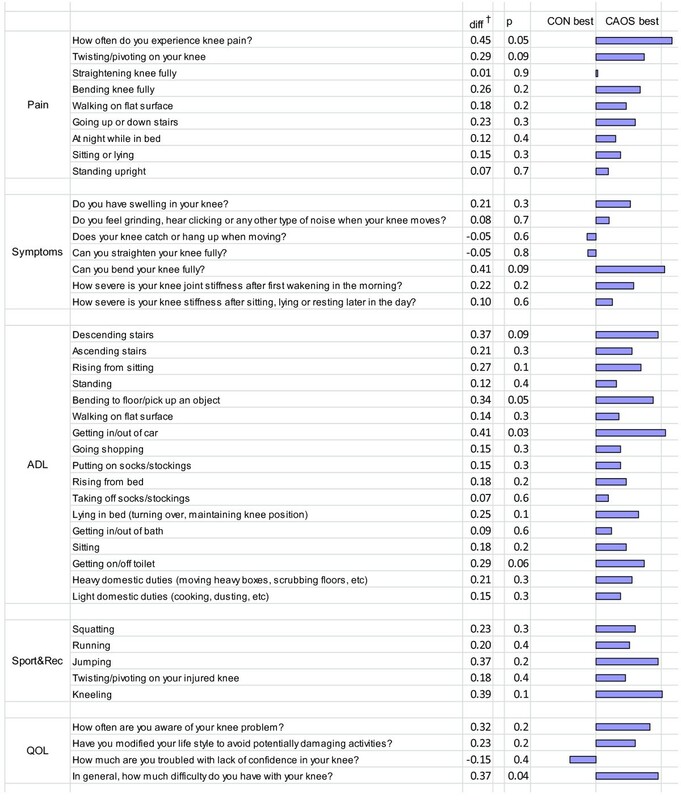 The questionnaire also included questions considering general health factors, needed to calculate the Charnley category [14, 15] applied to knee arthroplasty patients and the EQ-5D index score, which is a valid and reliable instrument for health quality measurement [16, 17]. The EQ-5D was filled in twice, to get both pre-operative score and the score at time of investigation. The patients were also asked to fill in a Visual Analogue Scale (VAS) concerning “pain from the operated knee” the previous month, and a VAS to describe “satisfaction with the surgery”. The self-administrated questionnaire was sent to the patient in June 2010 with an information letter, and the patients willing to attend returned the questionnaire with a signed consent form (to participate in the study). On radiographs, the average measured angles differed significantly in all angles except from the mechanical axis, but all mean measurements in the frontal plane were within ±1° of expected ideal. For the femoral component, there were statistically significant fewer outliers in the CAOS group compared to the CON group. 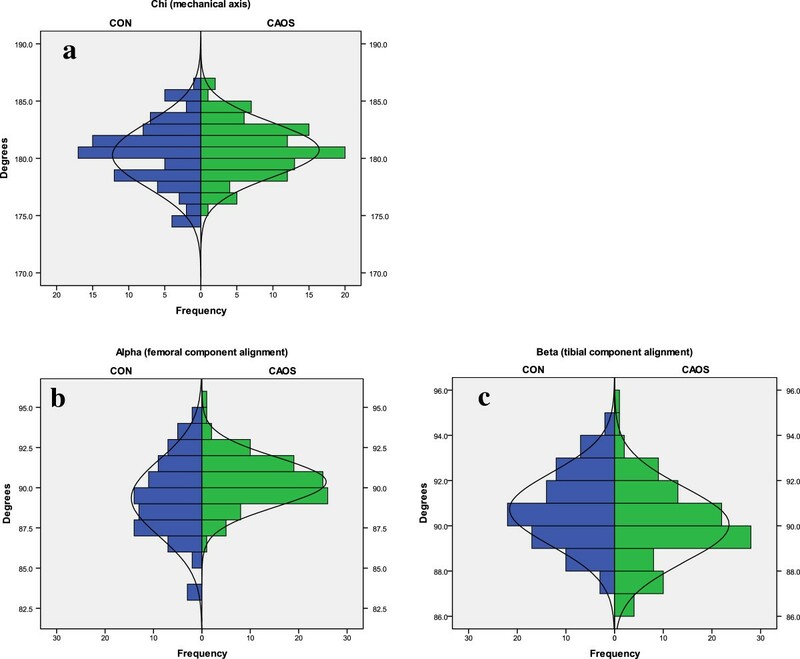 For HKA alignment and alignment of the tibial component, there were also fewer outliers in the navigated group, but the difference was not statistically significant. Previous studies have reported that patients operated with conventional technique have a higher proportion of outliers compared to TKA operated using computer navigation [2, 8, 24]. On sagittal radiographs, the range of measurements was wider in CAOS compared to CON. When operating by conventional method, the intramedullary rods determine the tibial slope and femoral flexion. In contrast, the navigation system allows the surgeon to modify the femoral flexion and tibial slope, according to the patient’s original anatomy. In our study, the surgeon aimed for more flexion of the femoral component and a more posterior tibial slope in the CAOS group. This was thought to improve flexion and with that also function scores [25, 26]. In the CON group, mean measurement was 90° for tibial slope, which is 4° more than ideal of 86°. There was no statistically significant difference in VAS score, ∆EQ-5D or any of the KOOS main categories two years after surgery. However, we found a clinically significant difference in three single questions in the KOOS score, all in favor of CAOS. Furthermore, CAOS had a better outcome in 39 of 42 questions, but the findings were not statistically significant and thus of uncertain importance. Two randomized controlled trials have previously found no clinical difference between CAOS and CON in scores of function and quality of life [27, 28]. A prospective randomized trial and a recent follow-up study reported a higher Knee Society Score and Short-Form 12 physical scores for patients with coronal alignment within 3° of neutral, regardless of surgical technique . Including all procedures, the CAOS group had an average operation time of 11 min shorter than in the CON group. However, there was a considerable amount of uncemented prostheses in the CAOS group. By excluding all uncemented prostheses, the difference in operation time was 4 min in favor of CAOS, and the result was not statistically significant. Previous studies have reported longer operation time when using navigation [2, 6, 29]. However, other studies have found that surgery duration is reduced remarkably once the surgeon is experienced with navigation, and that the operation could be performed equally fast, or even quicker with CAOS when the surgeon is well-experienced [7, 8]. A short-term register study on data from NAR , found that mean operation time in all Norwegian hospitals was 92 min with conventional total knee replacement and 107 min with navigation.